My grandfather and I had an excellent tradition of "The Christmas Outfit." We'd go shopping for a whole day to find an outfit, head to toe, hat to shoes, and then open it on Christmas. It was an amazing tradition and every time I shop, I miss him the most. He was an artist, painting was his medium, and had such an eye for the color and shape of things. He always had me looking like a style icon, at least one outfit-worth. Being 30 has brought its challenges. The acne, hot flashes and the constantly nagging notion of "Wait, shouldn't I have health insurance?" don't ever go away. 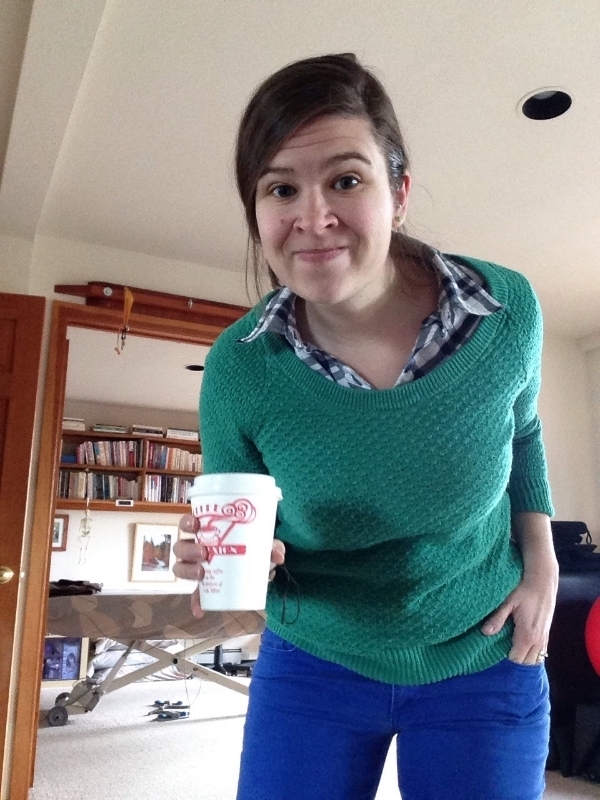 I'm also constantly trying to figure out how to dress myself. I got real excited last winter when I found a sweater in a thrift shop that had real gnarly silver spikes on the shoulders. Before I had a chance to wear it to work, an eighth grader showed up with the same one. It was a Forever 21 brand sweater, which when you really think about it, being "Forever 21" sounds like a prison sentence. A very close second to "Starbucks for Life." Conversely, I feel like I need a real good 401K to shop at Banana Republic. And now that I'm no longer in need of "business casual" as I am on track to work from home full time and live in flannel/beanie world, am I now free to wear my donut pajamas to work? With how much I talk about cartoons, that feels like I'm growing "down." Pinterest helps not. "Women's Fashion" has a lot of outfits with cut off heads. How am I supposed to know if my head matches that outfit if I can't see theirs? Also, my body doesn't make sense for a lot of these. I'm fairly certain that dress would make me look like the leg lamp from The Christmas Story. Also bags? I haven't carried a "bag" in two years. So what combination of words do I search to see people that look like me? Invisible Fashion for Sarah? So then I embrace the West Coast mentality that you can do whatever you want and be whoever you want to be! I went to Junky's Clothing Exchange, a popular Burning Man outlet, and let myself live. I also became a human trophy figurine. I don't really know what's appropriate anymore. I kind of feel like an awkward teenager that doesn't know where she fits in. I visit home in less than two weeks. Small town mountain life to midwest suburb/city life where I will inevitably see everyone I went to high school with at the mall. This shocks me brain. I feel like packing for Christmas Break means trying to figure out who I'm supposed to be in the "city" so I don't have to deal with the stares, the "what are you wearing?" raised eyebrows that make me want to hide behind a very large object (note: there aren't a lot of boulders in Ohio/Michigan). Most days I look like this. And after years of agonizing over outfits, highlighting the contours of my face, buying three different curling irons and the right kind of hair gel, I came out to this small town where none of that matters and let it all run out. And sometimes I feel like I've "let myself go" into this messy mountain woman that only cuts her hair once a year, that runs out of foundation and doesn't buy more, and the only time that makes me feel bad is when I'm back in the city where people spend lots of time and money on everything I've let go. And I ask myself this question: is this growing up? Accepting a paintless face, grownup zits and all, and embracing the tomboy you've always been before you let the world change you? I think selfies are a way of testing out your face before you show it to the world. I get it. Face dress rehearsal. And I'm real bad at it. So here is some advice that I don't know how to take. Live your life, whatever it looks like. Be brave enough to be drastically different than everyone around you. A coffee cup is a much more practical accessory than a bag you can't take on a hike. You're only as weird as you let others make you. Go ahead and mix those metals, girl. Silver AND gold. Embrace the duality. P.S. These are my new style icons. 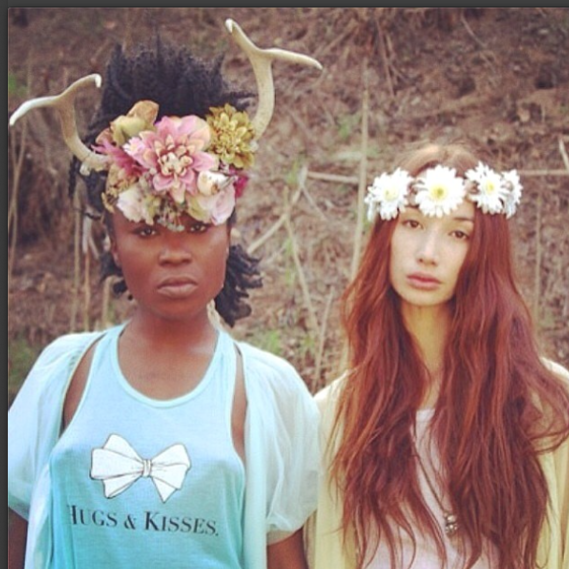 Antlers and flower crowns. WHAT ELSE DO YOU NEED TO KNOW?